The storage of your data on the cloud is becoming common place today and its hard to think that it will change any time soon. I personally have been a big fan of cloud-based services since they first started to come on the scene a few years back. With it though comes concerns around security, most notably is the recent compromise at Dropbox. While this raises questions as to why a Dropbox employees had a list with user emails, its none the less something we have to deal with. Here is an instance where the vulnerability was the end-user. In fact, if you look at some of the more recent compromises at Security firms and big enterprises, often case the point of entry is through email credentials, but that’s not the point here. You can do what some security professionals do and avoid all technology, while I can appreciate the approach I prefer to find a way to work with the challenges. That brings us to the point of this post, securing your data while still leveraging the power of Dropbox and other cloud-based services. Being that I believe in the open-source philosophies I set out to look for a comprable solution. 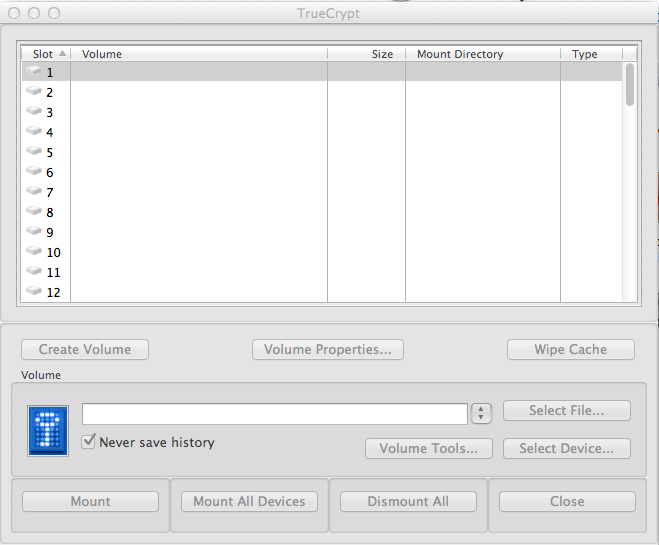 In my search I came across TrueCrypt, a free open-source on-the-fly encryption application. At first glance I was less than impressed with its website, it seemed less than appealing, but putting those initial feelings aside I quickly became engaged. I spent some time reading through their documentation and found that the solution was actually highly functional and so it was worth giving it a whirl. That’s what I’ll discuss in the remainder of this post, installing and leveraging TrueCrypt with Dropbox. The first place to start is on the TrueCrypt download page. There you will find the latest releases. 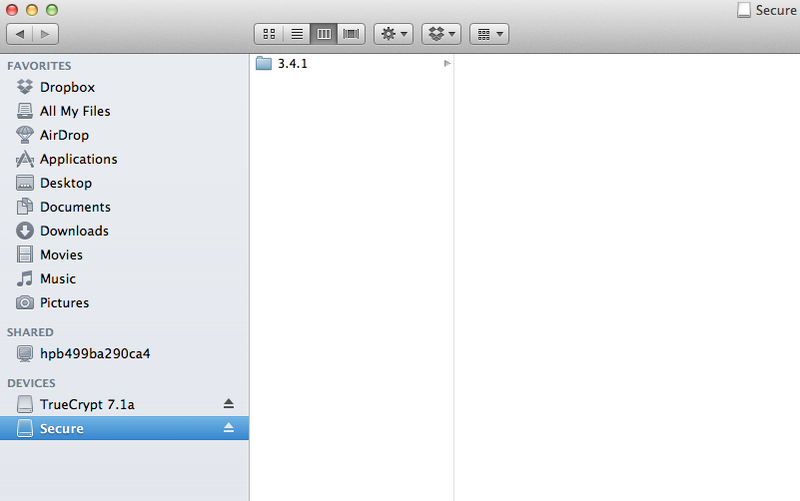 In this example I will be using a MAC OS X, version 10.7.4. Step 1. Installing is simple, simply navigate to the DMG you just downloaded. 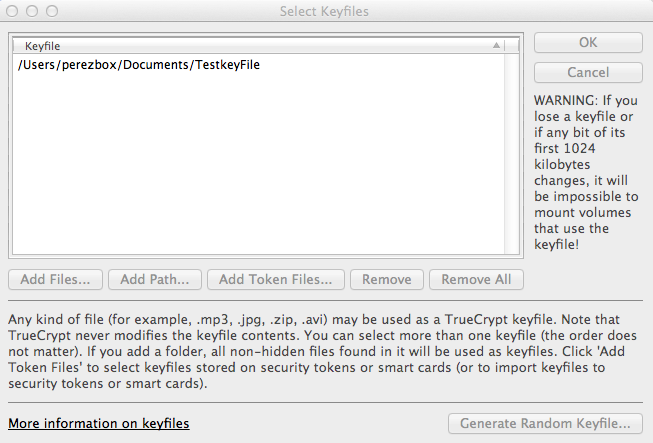 Double clicking the file will extract a mpkg file. Well, the good news is that its easier than you might think. This is an important page, if you’re looking to use Dropbox then you’re going to want use the Create an encrypted file container. This will allow you to move the container between directories, external drives, and yes, Dropbox directories. Next thing you do is select the typ of volume, for most all of you the Standard TrueCrypt Volume is good enough. Ok, the next page is bit confusing, at least it was for me. It reads Volume Location. 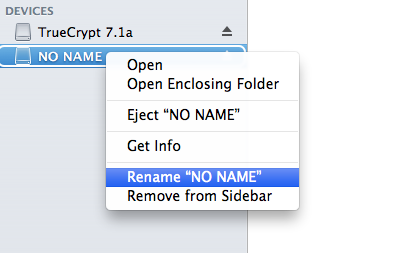 What its actually saying is give your container a name and choose the directory it will be created in. 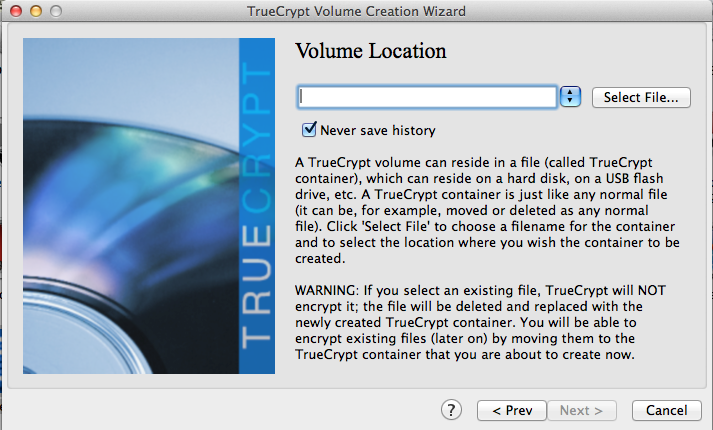 The good news is that you’re not tied to this location, you can create it locally, then push it into Dropbox. 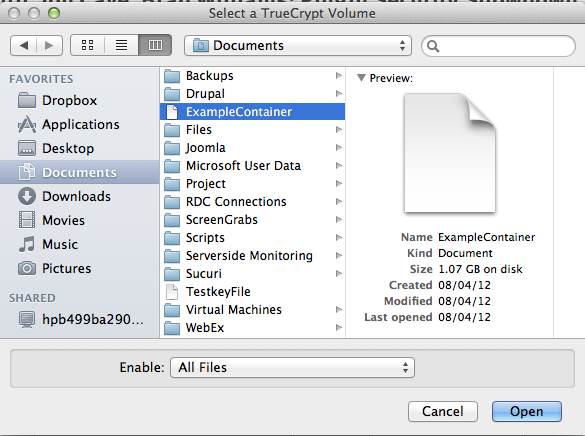 From the image above you can see my container is called ExampleContainer and it’s in the Documents directory. On the following page you’re going to define the type of encryption and hash algorithms to use on the container. I actually really like this, they offered all kinds of options and even allow you to apply a double and triple encryption to the container, a bit much you might say, but its good to know. I won’t get into the various types of encryptions or the hashing algorithms, but for most the users running your container with the AES encryption and SHA-512 hash will be more than enough. The next page is important, it asks you to define the size of the container. This size defines the amount of content you can put in the bucket. If you’re trying to protect pictures or videos you might be looking at a fairly big container, and that’s ok, but if you’re looking to use it with Dropbox make sure your account has enough space. 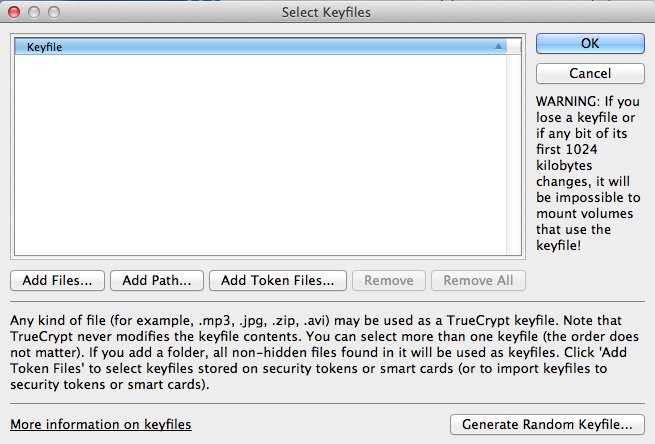 Note that you have the option to change the hash on the file as well. 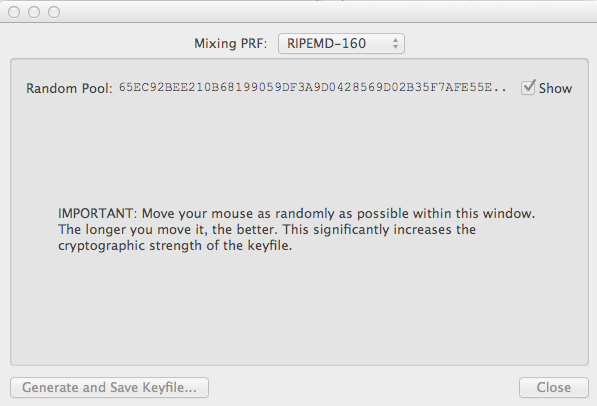 For this instance RIPEMD-160 is good enough for me. The more you move your cursor the more random the file. Pretty cool. 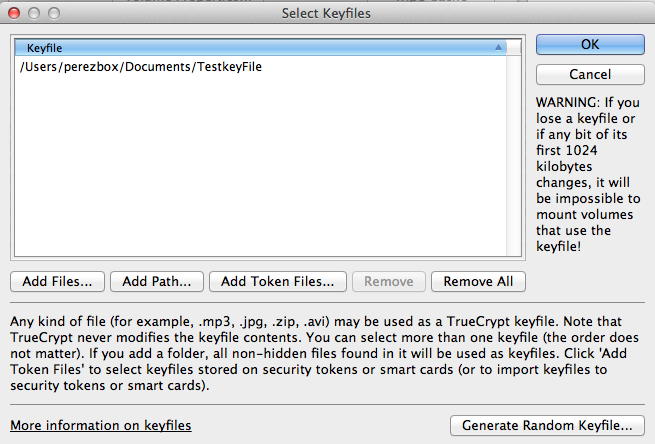 Once you’re done moving your curser be sure to click on Generate and Save Keyfile on the dialog. If you click close then you’ll have to start over again. 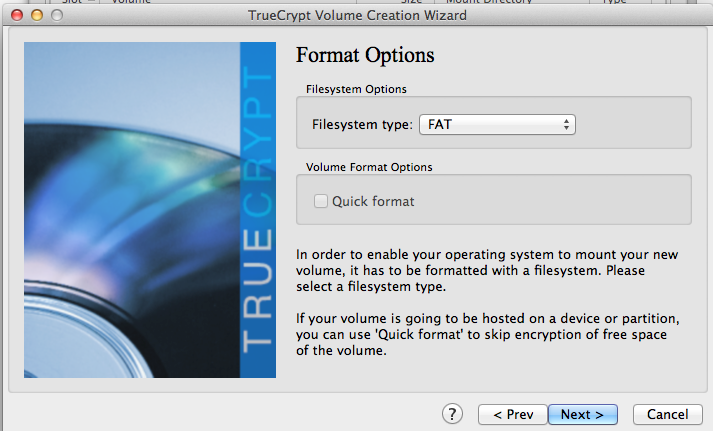 The last thing you do once selecting the type of format is to actually format the drive. Simply click on Format and you’ll be off and running. Note, that the bigger the container size, the longer it will take. This is even easier than the last section. 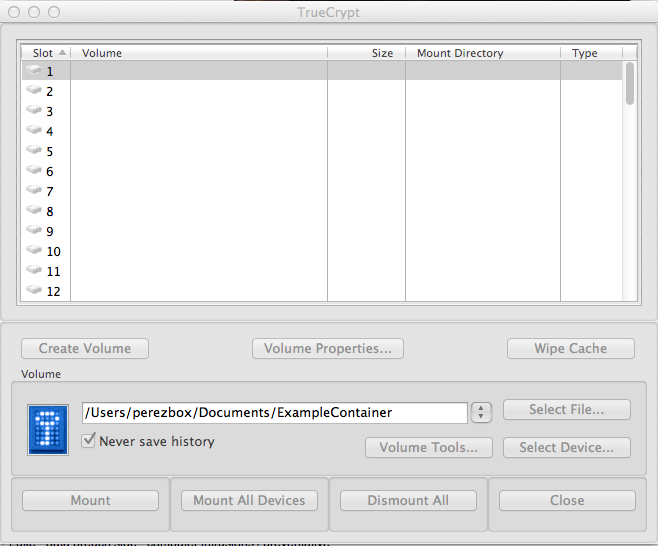 All you have to do here is copy / paste the container you created and drop it into a directory in Dropbox. That’s it!! The only thing to note is that you have to unmount the drive for it to synchronize with all your installs. And, in order to use on other machines you’ll need to have TrueCrypt installed, the password and the keyfile you created. 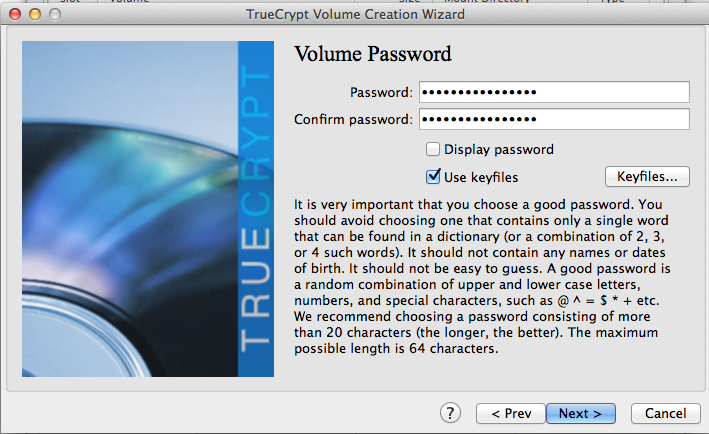 I’m not a TrueCrypt employee but am willing to help in any way I can. 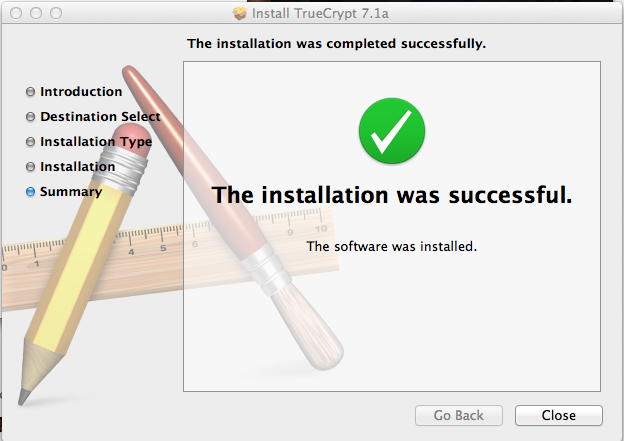 The other thing to note is that the installation and configuration above is also applied to Windows and Linux distributions. Cheers!